This morning at approximately 6:00 a.m., an off-duty firefighter was involved in a motorcycle accident with another motor vehicle at the intersection of US-1/South Dixie Highway and SouthWest 22nd Avenue, less than 400 years from Leesfield Scolaro’ offices in Miami, Florida. Little information is known at this time, other than the person riding the motorcycle was seriously injured and transported to Ryder Trauma Center at Jackson Memorial Hospital. His status is unknown. 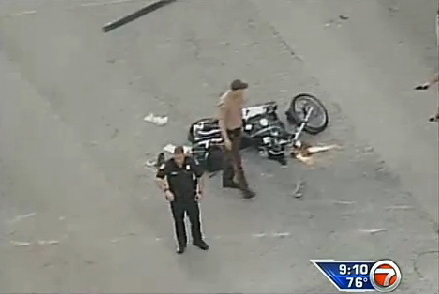 The other person involved in the crash is reportedly cooperating with the responding Miami-Dade County Police officers. Collisions between a motorcycle and a car are among the deadliest and more catastrophic traffic accidents. In Florida, there are on average 380 motorcycle accident fatalities every year since 2000. Each year In 2006, 2007, and 2008, there were over 500 motorcycle deaths.